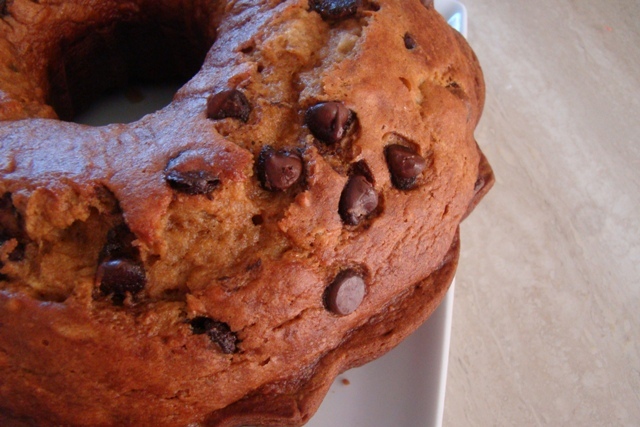 This is a classic pumpkin bread recipes (using oil instead of butter). Moist and packed with all the spices and flavor we have come to expect from pumpkin bread, it is a tried and true recipe. I have to be honest, though, I might prefer the moister, more aromatic version in my banana olive oil pumpkin bread. Combine pumpkin, eggs, oil, applesauce, water, vanilla and sugar until well blended. This is my idea of Fall comfort. The type that conjures up images of leaves changing colors, apple-picking, and children sipping apple cider while bundled in hats and gloves. 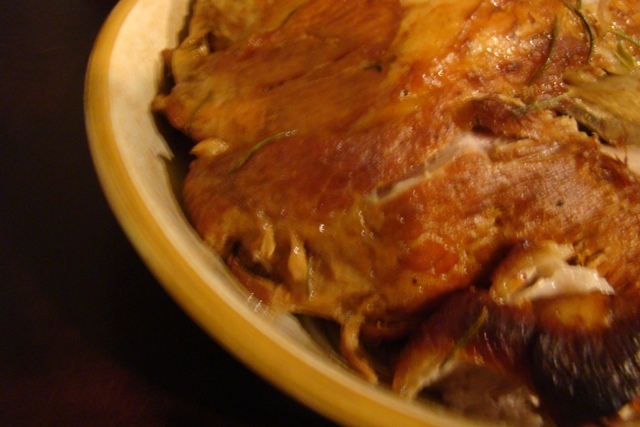 Pork, slow-roasted until fork-tender, infused with garlic, ginger beer, apples, cider, and stock. The recipe does take some time (mostly in the oven), but it can be done ahead and serves a crowd handsomely (or a family for more than one meal). Leftovers are delicious in a hash for breakfast or a sandwich or quesadilla for lunch. I heartily recommend it – with a slice of pumpkin pie for the ideal Fall feast. Recipe (and drool-worthy picture) here. Moist and flavorful, this melt-in-your-mouth bread is hard to resist. Fortunately, it’s fairly healthful – packed with fruit, fiber- and vitamin-rich pumpkin. Until you start loading it with chocolate chips and slathering it with whipped cream, which is what I do. My new favorite bread. Preheat oven to 350°F (180°C). Sift together the flour, salt, sugar, and baking soda. Mix the pumpkin, banana, oil, eggs, and spices together, then combine with the dry ingredients, but do not mix too thoroughly. Stir in the nuts and chocolate chips, if desired. Pour into a well-buttered 9x5x3 inch loaf pan. Bake 50-60 minutes until a thin skewer poked in the very center of the loaf comes out clean. Turn out of the pan and let cool on a rack. 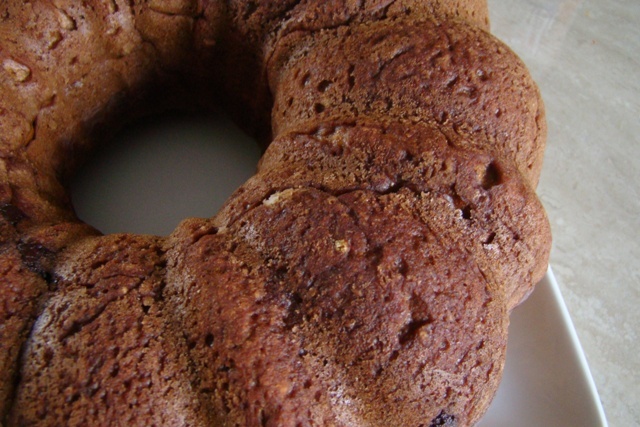 ***To prepare a bundt, as we did, double the recipe and bake for approximately 60 minutes. Lightly spoon flour into dry measuring cups; level with a knife. Combine flour and next 6 ingredients (through spice) in a large bowl. Make a well in center of mixture. 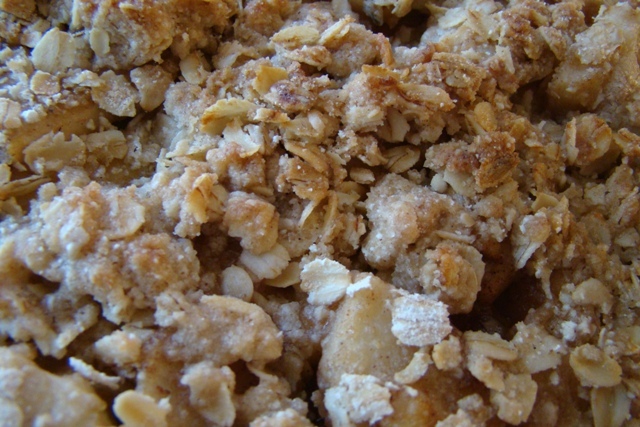 Combine milk, butter, vanilla, and egg in a small bowl; add to flour mixture, stirring until just moist. Gently stir in blackberries. 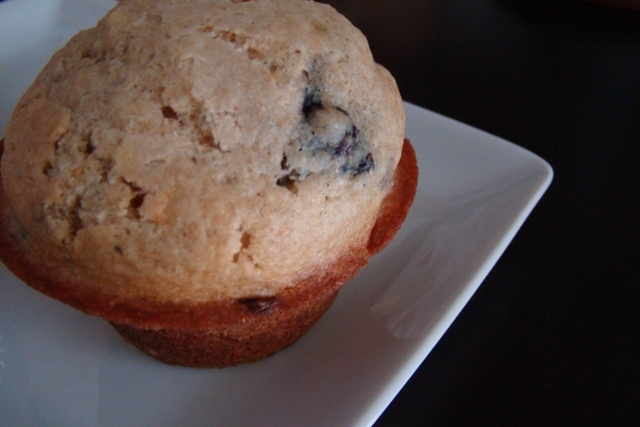 Spoon 1/4 cup batter into each of 17 paper-lined muffin cups coated with cooking spray. Bake at 400° for 16 minutes. Sprinkle muffins evenly with granulated sugar, if desired; bake 3 minutes or until muffins spring back when touched lightly in center. Cool in pans 10 minutes on wire racks. Every year we take Rice Kernel to a nearby farm to pick corn. Until I had my little fellow, I had no idea you could pop corn directly from the kernel! This year was Claire’s first trip and our curious little one was all too eager to pull at corn husks herself. Can’t wait until next year when she can join in the action on ground level. 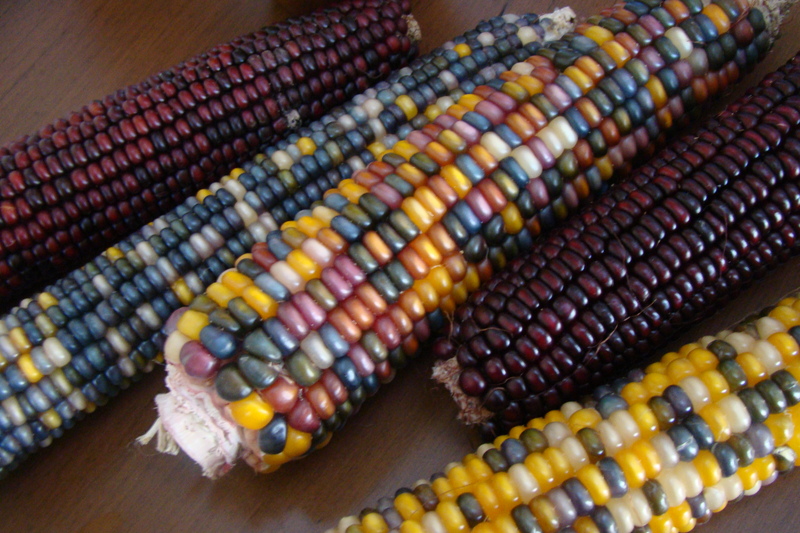 Ways to Enjoy Popcorn on the Cob…. 3. 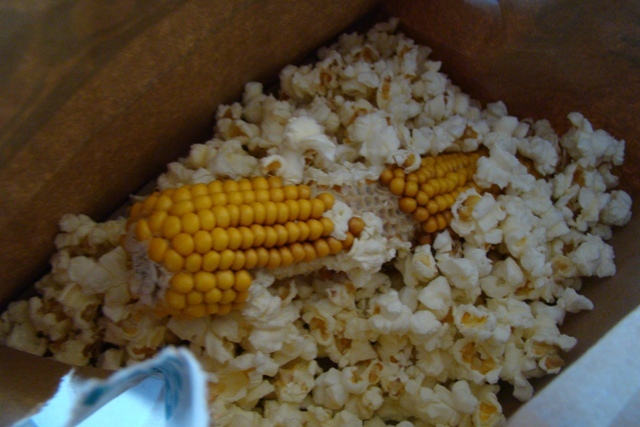 Another great favorite is to shell the kernels off of the cob and place them into a popcorn popper. I’m not the biggest pancake afficionado. Really, I eat pancakes because I love the whipped cream and maple syrup that accompany the pancakes. My little boy is similar and, to make matters worse, he’s not the biggest breakfast eater. So whatever I prepare for him better be nutritious enough to sustain him through the morning. These happen to be the perfect canvas for syrupy goodness. Wholesome and protein-packed, they make you feel good – and full – in the morning. The way every morning should start. In a small bowl, combine the flours, sugar, baking powder, and salt. Whisk to blend. Set aside. In a large bowl, combine the eggs, yogurt and milk and whisk together. If you are using a thin yogurt, no additional milk should be needed. If you use a thick yogurt such as Greek yogurt, add 1-2 more tablespoons of milk. Whisk in the melted butter, lemon zest, and vanilla. Add in the dry ingredients and whisk in just until incorporated. Warm the oven to 200˚ F and have a baking sheet ready (to keep finished pancakes warm). Heat a skillet or sauté pan over medium heat and grease lightly with butter, canola oil or cooking spray. Ladle about 1/3 cup of batter onto the cooking surface for each pancake. Allow to cook until bubbles begin to form on the top surface. Dot the top with berries. Use a large spatula to carefully flip the pancake and cook the other side until light golden and cooked through. 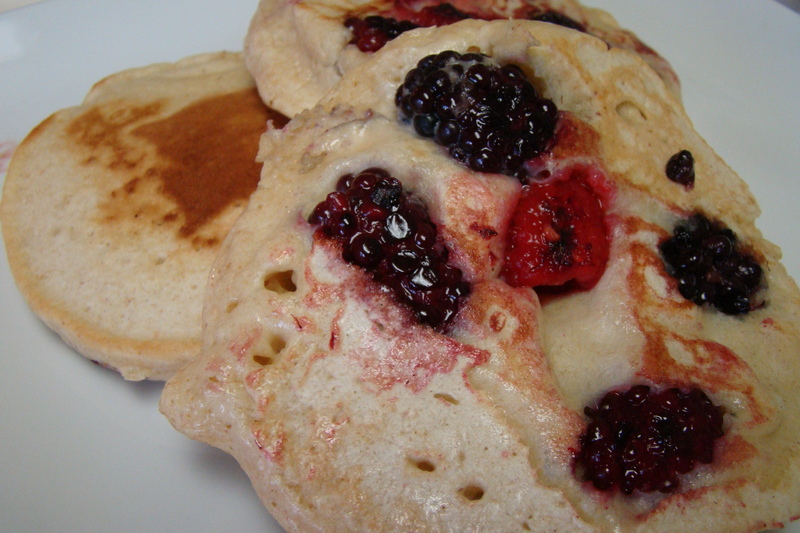 Repeat with the remaining batter, storing finished pancakes in the oven until ready to serve. Fresh and fragrant, we prefer to use firm pairs so the end result is not too soggy. The hint of ginger provides a subtle warmth that is perfect for Fall weather. Preheat oven to 350 degrees. Toss first six ingredients together in a bowl. Pour into a buttered baking dish. Using a fork combine the remaining six ingredients. Spoon topping across pears. Bake for 30 minutes or until brown and bubbly.